I figured that we might as well take a detour to a somewhat exotic locale for this strange little mall. In keeping with Canada’s typically crazy mall-building tendencies, the Brookside Mall is one of five (!!) 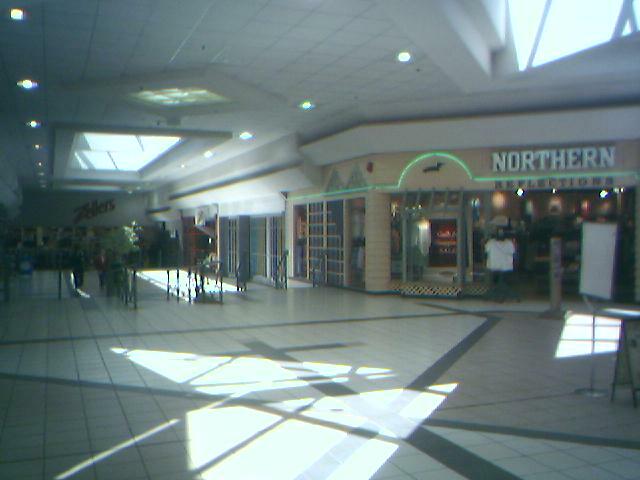 malls serving the greater Fredericton, New Brunswick area. Fredericton is a tidy, attractive little city in central New Brunswick and is the capital of the province. To say this area is remote is a bit of an understatement: Fredericton has only about 50,000 people, and there are almost no suburbs. When you leave Fredericton, you leave–the surrounding areas have almost no population at all. We were really fascinated to find that they actually watch Boston television stations up there–this is a seven hour drive north of Boston! 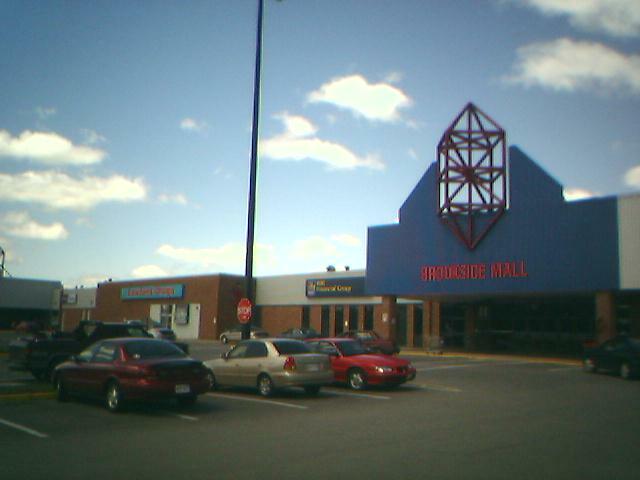 I saw the Brookside Mall on a road trip up to New Brunswick just about a year ago. This is the lone mall for the northern side of Fredricton, and seems to be emblematic of many smaller Canadian malls: it includes a Zellers, a Sobey’s Supermarket, and a dollar store (in this case, it is the somewhat puzzling “Rossy Fredericton,” which reminded me a bit of Woolworth or Family Dollar). While not dead, it’s easy to tell from the many vacant storefronts that the Brookside Mall wasn’t really thriving either. It seemed more typical of the kind of malaise that many smaller Canadian malls seem to endure, but quite unlike in the States, the tenants didn’t clear out wholesale. A mall like this one wouldn’t probably even be enclosed in the United States. Brookside Mall also had kind of an interesting design. 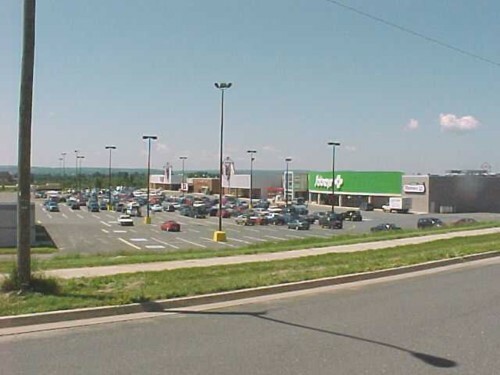 From the entrance on Brookside Drive (visible in the above photo) it appeared to be a standard older dumbell-style mall, with Sobey’s and Rossy Fredericton at each end. 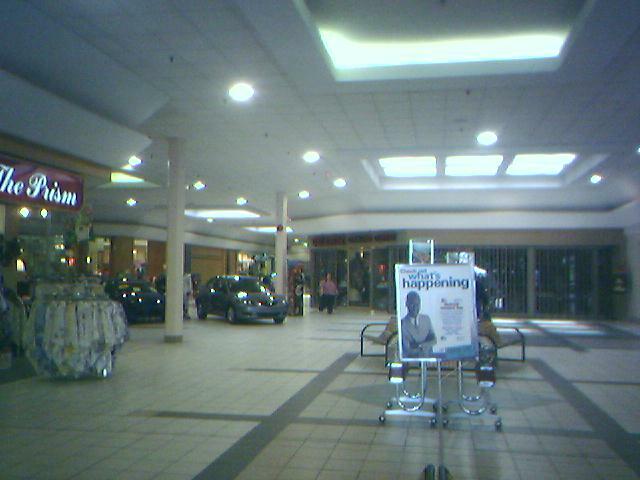 When using the main entrance, however, you find that there’s a larger hallway that goes straight back, then turns diagonally to the left, and ends at Zellers in the rear of the mall, making the center quite a bit larger than it seems initially. Furthermore, the style of the center (which is more or less laid out like a “V”) lead me to believe that a large empty space in the middle of the V was probably an anchor store of some sort, with entrances by both Rossy Fredericton and Zellers. 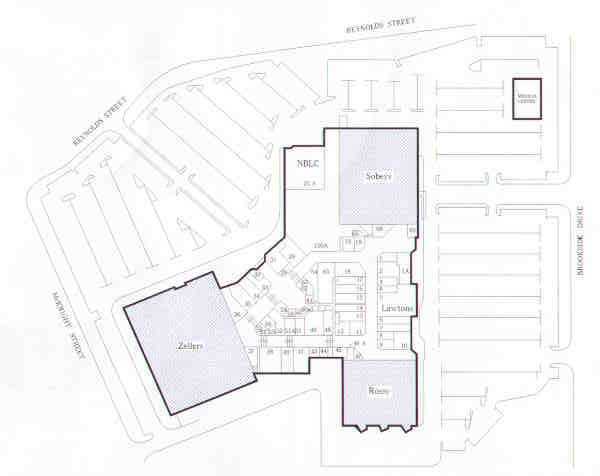 Turns out I was half right–according to the diagram below, there is an entire wing spanning between Zellers and Rossy Fredericton that was closed off when I was there last year. What a neat floorplan for a smaller mall! Befitting of its physical remoteness there’s almost nothing about the Brookside Mall on the web, so if you do know something then (as usual) please comment! I did find this leasing page, and a general article about big box development planned for Fredericton and elsewhere in New Brunswick. There’s no satellite imagery of that area, either, though if you feel like you might want to visit the Brookside Mall, here it is. You can zoom out and get a really terrible satellite photo, too, but why would you want to? It opened in 1980 as one of those tiny neighborhood dumbell-shaped (as you described) 10-15 store malls that sprang up all over small-town Canada around then. The anchors were K-Mart and Dominion (a supermarket), with a liquor store (which had mall access through a long corridor) out back. 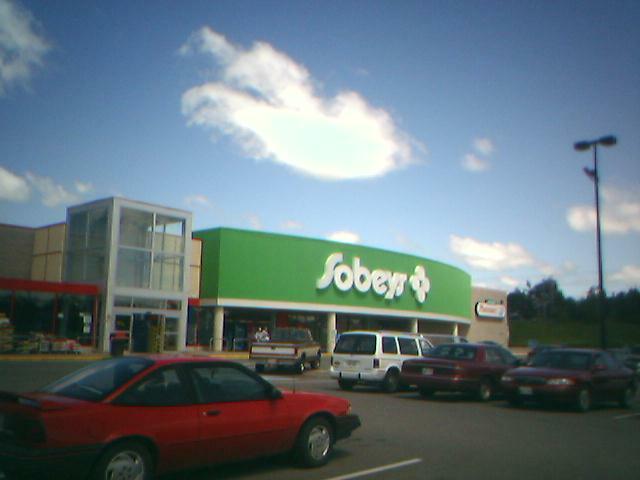 Sobeys took over the Dominion space when they pulled out of New Brunswick in 1988. 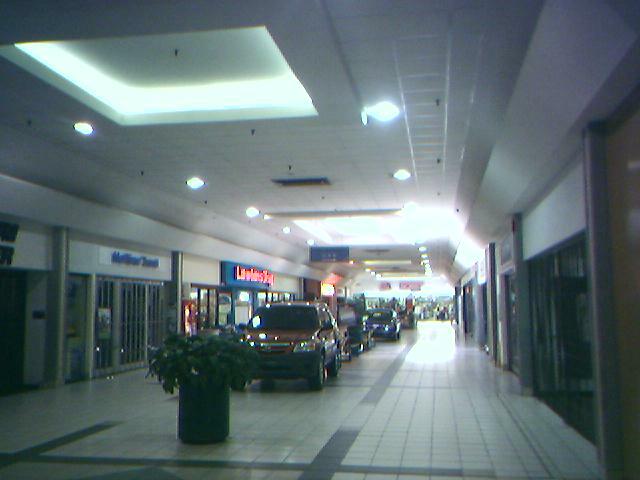 They expanded in 1991 and added the Zellers, with a food court and a few national chains, in order to compete with the “big” mall around here, Regent Mall, which similarly expanded in 1990. The mall was actually triangular shaped back then, with corridors connecting each of the three anchors. By 1995 virtually all the chain stores were gone (they just couldn’t compete with everything on the south side), and the last restaurant moved out of the food court shortly after that. When K-Mart left Canada in 1998, they tore it down and built it back up as a Sobeys, which obviously left its old space. Rossy (a chain based in Quebec that likes putting the city name on its signs apparently) went in were Sobeys was. By 2000 or so, a Cendant call centre took over the wing between Rossy and Zellers, shutting off that part of the mall and creating the weird shape you saw now. Since then, what few chain stores were in the mall (except for Radio Shack, Lawtons Drugs and a couple small clothing chains) are gone now too, replaced with a revolving door of local businesses. Wal-Mart is building a strip mall (or power centre as we call them in Canada) about a mile away off the St. Mary’s Street ramp from Route 105. This could be the final blow to Brookside Mall. Thanks for the information on these malls, JP! A lot of the Canadian ones are a mystery to me, and it seems that the network that exists for getting a lot of this information in the United States doesn’t really spill over into Canada very often. We’ll be posting about other Canadian malls in the future (and eventually I have to actually *visit* some of the ones in Quebec, which are among the closest ones to home that I haven’t gotten to yet) and would love some of your input whenever you know some details! I can add some more history as well. It was built by Diamond Construction. Before it was built, it was a large open field with an older farm house and a small bungalow side by side. I lived in both those homes as a child. We were living in the small bungalow when my parents were approached by Diamond Construction to build the mall. Our driveway became the first entrance to the mall. Our house was physically relocated up the road on Brookside Dr. to the last house on the right before you hit St. Mary’s St by Diamond Construction. I’m not sure of the date, but they removed that first entrance to the mall and just have the second entrance off Brookside Dr. now. The street is on also used to be called Heron Rd. and was changed to Brookside Dr. probably around 1980 if I remember correctly. The good news is that this area has really been developing lately (mostly because of the Hill Brothers). So over time, I think the mall will experience more growth and expand on the stores in there. Oh, and yes WalMart will be stiff competion for it. It’s why I think they should bring something like Staples or Chapters over to the Brookside Mall and then I’d never have to go to the south side to shop again, lol. If they ever decide to open northside locations (probably not, Chapters doesn’t even have one store in Saint John yet! ), I guarantee you it will be at the Wal-Mart power centre and not at Brookside. If you go to the developers’ website at smartcentres.com, you’ll notice the success they’ve had in getting other big box stores and chains at some of their other power centres across the country. The one in Saint John has SportChek, Winners, Kent and Old Navy, for example (and speaking of which, I’d be surprised if Old Navy doesn’t eventually end up in the one here). The new development along Brookside Drive could give the mall some sort of reprieve, but I’m not sure how much and for how long. In the long run, especially if they build some more ramps off Ring Road to St. Mary’s, I can see Brookside complementing the Wal-Mart centre. They would need a total makeover, though, perhaps even a de-malling like Fredericton Mall. I live in a subdivision just seconds away from the brookside mall, its almost sad to see how porrly this reatail outlet is doing. They have just opened up a new strip mall across the street called West Hills Village with M&M meats its first tenant and RBC not to far down the road so it will be intersting to see what comes of all of this!!!! The satellite image seems to be working now. Looks good. Cars in parking lot, that’s a good sign. 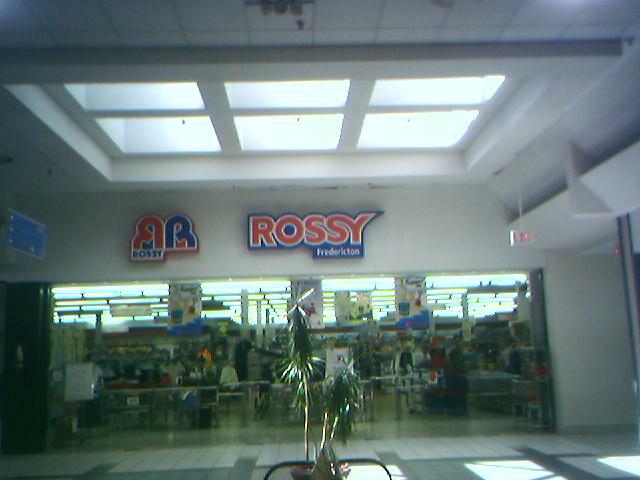 I just got back from the mall and there are signs all over Rossy saying they’re closing in January. Also noticed that Curves has moved from a spot across from Rossy to another place near Zellers. Wonder if they’re clearing the area out for something else or whether it’s just another nail in Brookside’s coffin. Are you also the famous JPKirby from the group misc.transport.road? anyway. It’s really cool to look at all of this stuff. Yes, one and the same. Still read m.t.r every so often on Google but haven’t posted there in years. Working on some new roadgeek stuff over at the506.com. 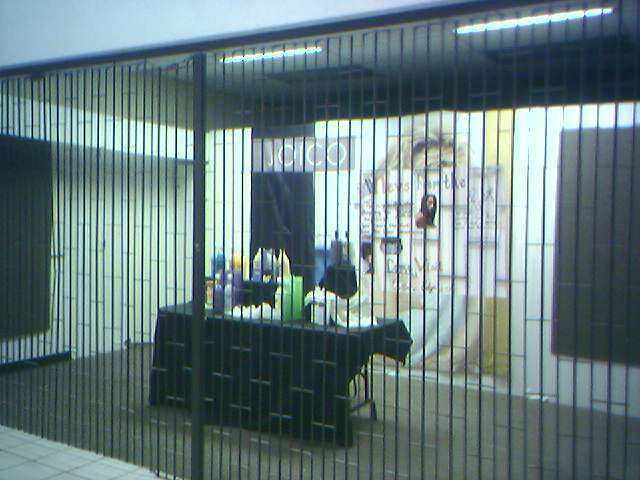 In another sign of how this mall is going down, one of the empty store spaces will be used as a polling station in this Monday’s municipal elections. If you happen to be voting there, say hi to me – I’ll be working the ballot-taking/vote-counting machine. Not sure if it was a buyout or a new store moving in, but the Rossy is gone now and there’s a Lawtons drug store instead. There’s also a Nubody (a gym) going in near the Lawtons. One nice thing about this mall, its a lot easier to get to then the Wal-mart if you don’t have a car. That area is a nightmare on foot (and the bus doesn’t go anywhere near it). I’m almost kind of glad the Wal-Mart opened where it did, because it sparked a much-needed review of Fredericton Transit’s route system. Hopefully there will be a new route going there by the end of the year. Went up to this mall today as I just moved to Fredericton for University and had to pick up something at the Sears store at this mall. Defintely an odd little place. I wasn’t there for very long because it was closed but tomorrow I’ll check it out a bit more (sunday shopping hours, really weird). The Sears store is just a furniture and appliance store. The former K-MART area is completely vacant. Will post more info later in the week as I will check it out tomorrow. The former Rossy is now a Nubody’s Fitness. The call center that has taken up about 1/3 of the mall is closing. One of the store owners was quoted in the paper as saying call center employees account for almost all of her business. This place is on its deathbed. Sobeys is the only thing keeping it afloat. I can’t see Zellers lasting too much longer. The Nubody’s gym is now well-established, there is a new call centre in the mall, there is a Curves (small, ladies-only mini-gym), a doctor’s office, and the zellers and sobey’s are still going strong. There are now a couple of restaurants and an RBC bank – it’s a quiet place, but still has a heart-beat! I like that you can access it by bus. They tried a bus route by the Wal-mart, but there just weren’t enough riders, and they closed it. Zellers closed last week. I’m not sure what’s replacing them. Hopefully not more office space. Prior to moving to Fredericton and whenever we visited and spent some nights in Fredericton it was always the city’s south side where we’d be when heading to the mall(s) and sleeping over so in this case we never shopped nor did we know anything about the Brookside Mall till we moved to the city and I just have to say that it’s too bad that it ain’t the mall that it once was and just recently Charm Diamond Center and Zellers closed down and therefore at this rate who knows? the mall may be forced to convert to a strip mall and also at this rate this mall essentially pales in comparison to regent Mall.